make it do, or do without. A nice saying but definitely not valid for our indispensable daily companions. Smartphones and tablets are truly globalised products: with total annual sales numbers in excess of one billion devices, they are used in all parts of the world and by a broad range of income groups. The raw materials production and manufacturing also follow a global pattern: the cobalt for the batteries and the tantalum for capacitors are sourced from the DR Congo, among other places. The palladium for electronic components mainly comes from the Russian city of Norilsk and from South Africa; and the silver needed for soldering alloys comes from mines on all continents. • The extraction of raw materials is often associated with human rights risks. • Mining and processing of ores in many regions of the world are a major source of pollution and environmental degradation. • The production of smartphones and tablets is highly energy-intensive – particularly the production of display modules, printed circuit boards and integrated circuits. So it becomes obvious that a major opportunity to reduce the total environmental and social impacts caused during raw materials extraction and manufacturing of smartphones and tablets is to use the devices as long as possible. Nevertheless, it is observed that smartphones and tablets are often used for no longer than 3 years. In many cases, the reason for early replacement of smartphones and tablets is not attributed to a defect. A large number of these products are replaced even though they are still functional (psychological obsolescence). The influence of short innovation cycles, as well as advertising and the tariff models of service providers are sources for lots of problems. 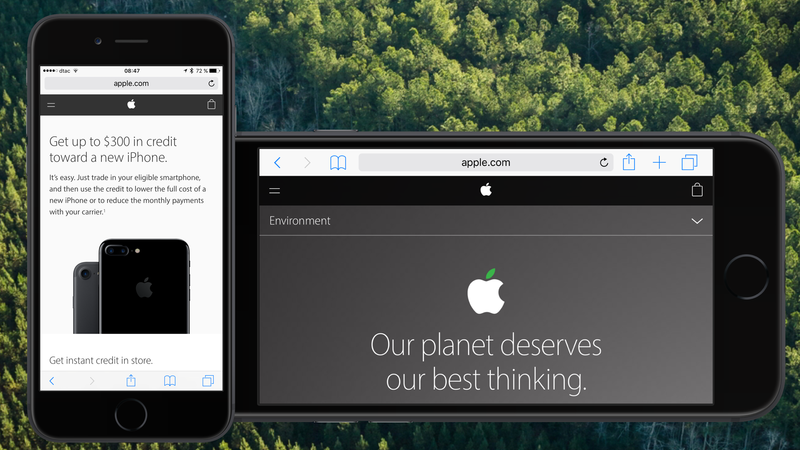 Apple tells us they do what’s technically possible to reduce their carbon footprint and take care of fair labor conditions but on the other hand they force trade-in offers to replace devices every year. Well, Lisa Jackson, that’s what should be revised. Your data centers and your new campus are outstanding examples for your environmental initiatives but your trade-up program is definitely a step in the wrong direction. And, btw, you aren’t able to fully control your supply chain. think twice before you replace your well-functioning smartphone.